Three years ago I came across a fascinating story of a young man in Malawi who had built a windmill from scratch, and I wrote about it on AfriGadget. 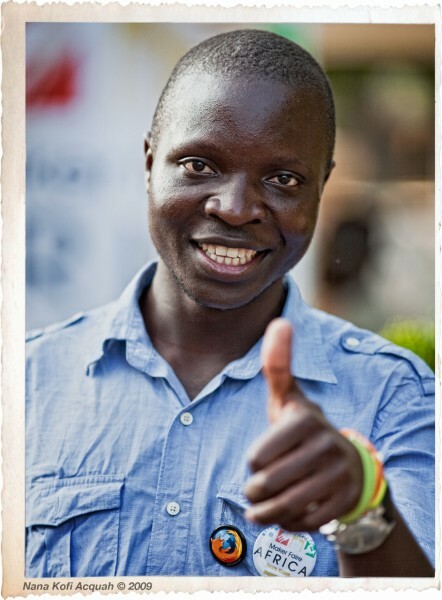 Since then, I’ve gotten to know William Kamkwamba as TED Africa fellows and most recently we spent a good deal of time together in Ghana at Maker Faire Africa. There is now a book, a documentary and a foundation all set up around the inspired story of windmills from Malawi. Fortunately, I was given a pre-release version of the ” The Boy Who Harnessed the Wind” to review, and as it comes out in just 4 days it’s about time that I did that. It should also be noted that Bryan Mealer, who wrote the book with William, is an incredibly talented writer that knows his way around Africa and has a knack for getting the nuances of African life across in a way few others do. I found the most fascinating part of this book to be Williamâ€™s description of living through a famine. Imagine only one meal a day, and only a few bites at that. Williamâ€™s family felt like they were the lucky ones because they at least had something to eat. Iâ€™ve seen pictures of people starving, but to have it described so frankly made it so much more real. Because of this famine, William wasnâ€™t able to go to school. His desire to still learn was what led to his reading books from the local library. It was there that he discovered the books â€œUsing Energy,â€ â€œExplaining physicsâ€ and â€œintegrated science.â€ Ironically, he discovered â€œusing energyâ€ (the book that inspired his famous windmill) while looking for the dictionary to look up â€œgrapes.â€ On the front of â€œusing energyâ€ was a row of windmills, and William was reminded of the pinwheels that he and his friends made as a child out of cut up water bottles. He spent days looking through old parts at a junk yard, trying to find the right parts to build his own windmill. As a young boy, William and his friends would often take radios apart and put them back together, cannabilizing some of them to fix others that were broken. A prototypical AfriGadget inventor, William was an expert at creative thinking and improvising, using a bicycle dynamo to power his first windmill. What I appreciate the most about William is, despite all the notoriety that has come with his inventions, he remains humble, easy to talk to, loyal to his family and home, and full of desire to learn. You see this come through in his interviews, even with all of the success he has had, he is still a well-grounded individual. A final bit of trivia: William’s windmill came very close to being the final logo for Maker Faire Africa this year, here’s the prototype of that. It’s great to see how he has influenced my work with AfriGadget over the intervening years. Many times he is on the stage at big western-focused events, however last month in Ghana he stood in front of his peers at Maker Faire Africa. The room of 300-400 fellow African inventors was enthralled… After all, how much more exciting is it to see home-grown ingenuity and innovation making it big than it is if itâ€™s imported in from overseas? The good folks at AfricaNews really helped us out a lot in Ghana by doing a lot of interviews and then putting together this video compilation of Maker Faire Africa. 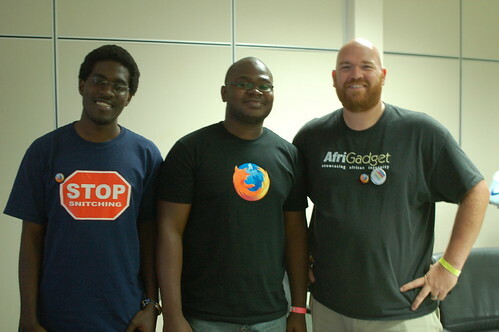 We’ll be holding Maker Faire Africa again next year in August, this time in Nairobi, Kenya. Get ready for an even bigger and more festive event! I was supposed to put on a talk to day at Maker Faire Africa (high-tech side) about mapping on mobiles and web, but when the time came it just didn’t feel like the right thing to do. Instead, with the mix of people at the room I launched into a discussion about what I saw as a lack of communication and cohesion with in the Ghanaian programming community. Everyone agreed that there is a lack of general communication and collaboration in this space, though there are a few user groups for things like Linux and a new one for Java. It’s too bad really, because I don’t think there is less talent in Ghana, but that this lack of cohesion of the tech community means that it’s hard for people to “announce” new things and/or get help for areas that they need to get assistance in. The reason I see this is due to the great activity that I see on the Kenyan Skunkworks email list – the contrast between Accra and Nairobi in this is quite stark. At the end of the discussion, everyone in the room decided to try for the 2nd Tuesday of every month at 7pm. Daisy Baffoe is the one with the list and is going to get in touch with everyone with a location. 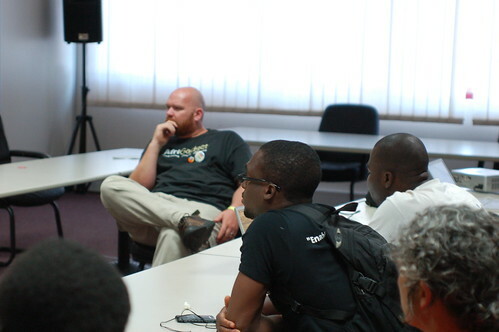 Hopefully we’ll see the beginnings of a general programmer community in Ghana!